Enter to win a free OtterBox courtesy of Verizon Wireless – an Dallas Cowboys NFL Defender by OtterBox. 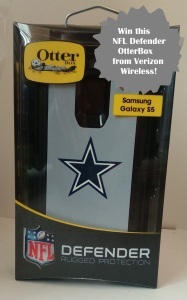 Verizon Wireless sells the NFL Defender by OtterBox with any of the NFL’s 32 team logos to fit either the iPhone 5/5S or Samsung Galaxy S5. Click here to win an NFL Defender by OtterBox for iPhone 5/5S. The NFL Defender by OtterBox has a built-in screen protector along with rubber tabs to keep dust out of your phone’s button controls. It features both an outer layer and two-piece internal shell for provide your phone with extra cushioning and protection against drops and bumps. It also includes a belt clip/holster/kickstand. Many experts consider OtterBoxes the most reliable protective cases for smartphones.